Where do songwriters write lyrics? 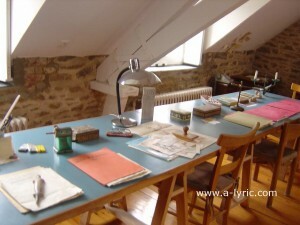 Jacques Prevert’s desk. Is this tidy or what? I often get questions about lyric-writing, but had not thought about this question. Where do songwriters write lyrics? I had to make a conscious effort to remember where I usually write (I almost said “work”!). It quickly opened up onto another question: how songwriters and lyricists actually write. Let’s look at the first person singular: me. At all times, I carry small notebooks with me. 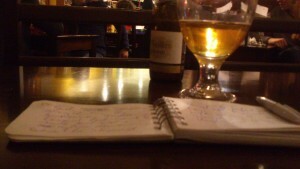 I know it sounds old-fashioned, but I do actually use them to jot down thoughts or possible titles. In addition to writing lyrics, I also work on websites, write articles, do copywriting and have even been asked to find product names. There is always something I can work on in some way. When you write with any regularity, there is a danger of falling into habits. If you consistently write in the same conditions, you can find yourself consistently writing the same things, or at least using the same point of view. To break that – and to also make the most of time away from my computer – I regularly write anywhere I happen to be: airports, laundrettes, at my desk, in the sofa, waiting for food in a restaurant, late-night beers on my own. When I did more dance music, I used to even write standing up, as dance is a physical style. I put the notebook on the top of my fridge and wrote there, if not actually dancing at least swaying to the tune’s groove – try it, it really gives a different perspective. Most of the writing – and certainly the final draft – happens at my desk, but these locations do inform the writing in some way. Maybe a tune you hear on the in-house music system sparks an idea. Maybe a headline in a newspaper can lead to a title. Maybe some people-watching will enable you to create a character you would not otherwise have considered – or enables you to get into their head more realistically. The other great thing about writing outside your office or home is that it’s a very productive way to spend time. Think about the last time you had, say, ten minutes to wait for a bus, train or waiter. What do you do? Nine times out of ten, you probably flick on your phone and check Facebook, Whatsapp, Twitter or incoming e-mails. If you add up all the periods of ten minutes you spend doing this in a week, you’re well over an hour or two per week. Put them together over a year and you could have written Tolstoy’s “War and Peace” in that time (or all the episodes of “Breaking Bad”, which is nearly the same thing). What a question? Most of the people never think about it. Lyricists are the creator of new things and they really need some inspiration for it. What does it take to write songs for name artists?